In part one of this series I described some of the threats to our NHS in its present form. While nobody can predict the future with accuracy it is worth taking a moment to consider where we are heading if nothing is done to protect the service. You will find this hard reading. No doubt some will accuse me of scaremongering. I concede that the picture I will paint is grim but I truly believe it to be a real possibility. I will not suggest a precise timescale these events – that would really be stretching it too far – but suffice to say we are talking months to a couple of years rather than decades. To follow the logic of my argument you need to have read part 1 of the series. Let’s start from the current situation. Emergency departments in hospital trusts are under extreme pressure. Ambulances cannot offload at hospitals so there are not enough vehicles on the road for new emergencies. Hospital bed occupancy is near 100%. Mental health bed occupancy is over 100% with patients sitting for days in emergency departments waiting for places. Primary care is struggling to cope with increasing demand. GP workloads have rocketed and we cannot recruit enough GPs to replace those taking early retirement. Social care is near breaking point with limited community places and no cash for care packages. We have already started to see a deterioration of performance against government operational and financial targets affecting all sectors of the health economy. Emergency department 4 hour waits, ambulance pick up times and cancer treatment targets have all deteriorated. Two thirds of acute trusts are in financial difficulties and some may go bankrupt. Senior managers will be put under enormous pressure by Monitor, NHS England and the CQC to improve both financial and operational performance AT THE SAME TIME. There will be some extra cash from a government slush fund which will be trumpeted but will be manifestly inadequate. CEOs will find their jobs are on the line so they will respond in the only way they know. By putting more pressure on their front line staff, cutting non-essential services to the bone, cancelling elective work (while being careful to shuffle the patients around so elective targets are not compromised), freezing vacancies and putting a ban on procuring paper clips. This will not work. Performance will deteriorate. Staff morale will fall and recruitment will suffer. General practice and front line emergency services will be the first to really struggle with recruitment. The private sector will look appealing to exhausted staff and some will jump ship. The regulators will up the ante piling on the pressure from the centre. Ministers will screech that something must be done. A couple of high profile CEOs will be sacked, and several more will walk while they have the chance. Unsurprisingly their vacated posts will not attract any suitable candidates and other non-executive board members will “act up” on a temporary basis (which eventually will become permanent). The twice daily local health economy teleconferences between commissioners, acute and ambulance trusts, primary care and social services will become increasingly acrimonious and ineffective as the combatants try to shift the blame away from their service. Participation will be delegated down to more junior managers until they fizzle out completely. Eventually Monitor and the CQC will realise that trusts cannot reasonably expect to meet the targets and will back off. Watch out for this happening because THIS IS WHEN IT ALL FALLS APART. Services which have only been kept going by fear and Draconian management will take their collective feet off the gas. Burnt out staff will accept patients waiting on trolley for 12 hours as the norm. Quality and patient experience will plummet. Waiting lists will increase, routine surgery will be reduced and “non-essential” services such as infertility will be discontinued altogether. While all this is happening private healthcare providers will tender for the profitable parts of the NHS. They will usually win these bids, partly because they have more resource to put into the preparation and partly because they can afford to offer loss leading prices. 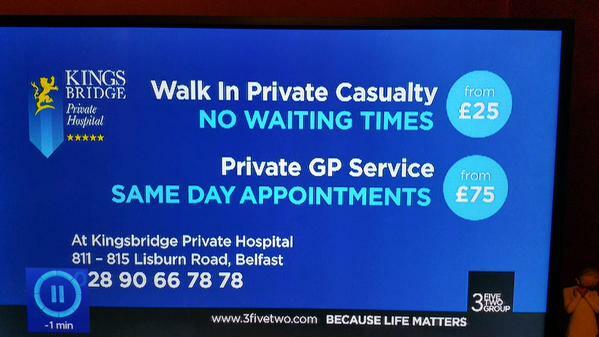 Current NHS providers of these services will disinvest in staff and equipment. Some may even be slightly grateful as it gives them an opportunity to meet cost improvement targets – but they will be deceiving themselves. The private providers will attempt to make any money out of their new services. These will still be branded as NHS so the public will be largely unaware of what is happening. They will cut costs, downgrade staffing, avoid complex cases and stoke up demand for the profitable parts of the service. They will try to maximise profit by offering “enhanced” services for cash top ups. If it turns out to be too hard to make money they will walk away, leaving a hole for the NHS provider to fill. But remember – the NHS provider has given up the staff and equipment for CIP and they have no cash to reinvest. Some private providers will take advantage of this and renegotiate a better contract price. As the core NHS business shrinks, quality nose dives and waiting times rise there will be a big increase in the number of people with the spare cash taking out private health insurance. This will lead to a steady growth in the non NHS private sector (as opposed the private sector still branded as NHS). Many of the most powerful and influential of the population will become less reliant on the NHS. Pressure to keep it going will diminish – by that stage it will be pretty rubbish anyway – and it will become an organisation providing second rate health care for those without insurance. It will be staffed by a combination of skilled altruists and no-hopers who cannot make it in the private sector. Patients who genuinely need to access healthcare will stay at home because they don’t want to impose on a pressured system – and nobody will have the energy to try to persuade them otherwise. At the end of the day we will have a fragmented healthcare system. It will be much more expensive but we will pay for the increased costs through insurance schemes rather than tax. It will be inefficient, inequitable and socially decisive. Illness will be a financial as well as a physical catastrophy – even for the very rich. I warned you it would be grim. I scenario I have described may be towards the “worst case” end of the spectrum but there are other potential issues that I have not included which could make it even grimmer – a flu pandemic for instance. Whether or not you believe all of this analysis to be correct there has to be a great deal of cause for concern. Much, if not all, is avoidable but it will take early and decisive action from a strong government to fix things. In the final blog of this series I will describe what I think could be done to save the NHS, and you will have an opportunity to have your say too. ← The future of our NHS – Reasons to be fearful 1, 2,……..10! Agree with a lot of this. Looking forwards to reading your next post on what you think can be done. Should we do nothing? No. What we should do is put the failed experiment of an near-exclusively state-financed, state-organised and state-run healthcare system to an end. In 1997, too, Labour said there would be no more NHS if the Tories won. Then, Labour near-enough double NHS spending. Standards did go up a bit – partly because of medical advances nothing to do with the NHS itself – but waiting lists actually got longer and the UK made no progress relative to other nations in treatment of major diseases. What is absolutely clear is the answer is not (just) more money. The whole organisation and provision of healthcare is what is wrong. There is no other country in the advanced world where healthcare is as state-dominated and state-centralised as England, even under the current semi-privatisation. The NHS has worse patient care and outcomes than almost any other western country, and even some eastern European nations are pulling ahead of the NHS in treatment of conditions like cancer. Look at the Netherlands, Switzerland, or Germany. Take politicians out of healthcare. Put patients as the consumer at the centre of everything health providers do. Let people choose their own insurance plans, doctors, and providers. Subsidise the premiums of the worse-off to ensure universal coverage. Don’t reform the NHS – abolish it. you sound like a CEO of a private haelth company or a right wing tory or UKip supporter. NHS in uK is most cost effective compared to the examples you cite where health care costs more to user. I agree with Kumar. The evidence for cost effectiveness is against you. But more importantly so is the evidence for accessibility, equity and comprehensive universal provision. When the state has no duty to provide then healthcare becomes a consumer choice, not a human right. And it is a poor case for consumer choice. The patient – who has no choice at all over whether they need care for their illness and does not have effective access to information to make a meaningful ‘choice of providers’ – ends up at the mercy of the private companies who certainly do have a choice – whether the cost benefit to their profit line is worth it. Complex, intractable, resource hungry, long term condition? You’d better be very rich, because it will be the cash starved under resourced public sector you’ll have to rely on otherwise. Forgot to add. The NHS’ cost as a percentage of GDP accelerated rapidly in response to the introduction of the costly market, privatisation and the extraordinary loss of our assets via PFI leaseback which means we now pay rent for things we once owned. If al the money spent on servicing the market was spent on clinical management and frontline staff instead we’d still have a service run on the cheap but it would be utterly brilliant. OK so we have , or rather had, the best healthcare system and the cheapest in the world. So of course certain people would rather by far we looked at systems further down the ratings, and costing more money. We are British, so we can’t possibly win at anything, right?? Also no chance for ME to make a profit!! The people were really liking it, other populations, or at least their more educated members were green with envy, which is not good for the plan, so lets run it down to crisis point, Tell everyone we are investing but not that most of it is going into privateers pockets, shreik at every opportunity via our corporate privateer friends in the media and via every troll we can slip a few bob to that it is slipping in the ratings, and the service is now shoddy, and then soften the population up enough so we can go for a far more expensive and less equitable system – Job done, lets light the cigars and open the bubbly!! Sod the less well off, WE will make a killing – literally. Your arguments have been peddled for over forty years now and the more the Neo-Liberals like yourself have influenced economic matters the further our country has gone into decline, this of course was never inevitable but as a consequence of this kind of bankrupt ideology. Your argument is hollow, callous and completely false. The NHS is the most cost effective healthcare system in the world. Fact. The delivery can improve there is no denying that but the current problem started 8 years ago when the government interjected and altered doctors training forcing many highly skilled passionate doctors abroad. The NHS organisation is not wrong, it is the mismanagement from government officials who feel that a nations health is something that you can solely quantify in terms of monetary value and target times. Imposed projections and targets from management that are out of touch with the daily workings of the NHS only serve to stretch the service thinner. Your plan to have a pay as you earn and choose basis negatively impacts the financially unable, poorer educated, poorer informed members of society. It will widen an already present social gap and will cause significant health inequalities. Your right wing point of view is not moral. Your point of view favours the rich and negatively impacts the poor. Look to America for a sterling example of such horrific health inequalities which would happen as a result of your proposal to abolish the NHS. Sometimes the right, moral thing to do isn’t the easiest. Unlikely again that you could sympathise. I suspect you would rob your own mother if there was an economic benefit. I feel sorry for your lack of compassion and understanding in how the vast proportion in our country live. My more socialist views come from a career as a doctor spent treating some of the weakest and most vulnerable members of our society. Most of the comments above in he article are an unbelievably scary reality of what is happening. The government is dismantling the NHS. My health and life will not be affected as a Dr, I will earn more in private healthcare, in new brighter hospitals, with staff that are happier and less worked. I will have more time to spend with loved ones. It is for the people whose lives are more unfortunate than myself that I am fighting for. As they do not have a voice and cannot always fight for themselves.